The screw is a result of the research done by the German company SYNTELLIX, whereas following about 18,000 implantations the screw has been approved by the Ministry of Health for marketing in Israel. Sarel has started to supply MAGNEZIX – a revolutionary screw used for bone fixation after operation. This screw is a medical technology breakthrough in the field of orthopedic surgery. It is a compression screw that is completely absorbed in the bone, is more strong than polymer screws, is as resistant as a titanium alloy but advantageously, unlike titanium screws, it biodegrades as the bone tissue grows and in fact presses it. In the course of a surgery, the MAGNEZIX implant is applied to the injured bone, supports it and acts as sort of scaffold upon which the bone is then built anew. As the new tissue grows, the implant dissolves slowly and is removed from the human body by means of the metabolic process. This feature makes it unnecessary to perform a repeat surgery in order to remove the implant from the body, as needed with other implants that in certain cases remain in the human body forever. 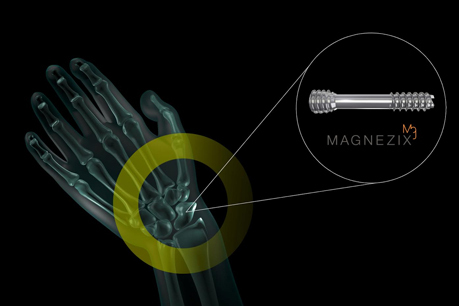 Unlike conventional implants made of steel and titanium, the MAGNEZIX’s biomechanical qualities conform maximally to the human body’s bones. Besides that, MAGNEZIX has elasticity similar to that of the human body’s bones, and osteoconductive properties that facilitate the bone regeneration process while the screw is biodegrading. The screw is absorbed in the course of about three months and is completely removed by means of metabolism within one year to one and half years at most. The biodegradation of the MAGNEZIX implant prevent the sharp rise of the permitted mineral content in the human body. The SRI scans indicate that in three years after the MAGNEZIX implantation, the tissues turned into a hard bone, like it originally used to be. The screw is a result of the research done by the German company SYNTELLIX, whereas following about 18,000 implantations the screw has been approved by the Ministry of Health for marketing in Israel. The company offers products based on the same alloy, which will start to be marketed in the course of 2017 for orthopedic applications and will include absorbable metallic pins and anchors. For more details please contact Sofi Rubin, Medical Equipment Department manager, at 09-8922069.